c) super easy to make. A good swaddling blanket is at least 40x40 and made out of a thin enough material that it is easy to wrap around the baby and tuck in. We preferred a lightweight flannel with our first son even though we were using them in the summer although in warmer climates, something like muslin or even a trimmed down cotton sheet would work well. If you buy flannel by the yard, you'll find lots of prints and solids but the width probably won't be any more than 44 inches (which after washing, drying and finishing the edges will end up just at 40 inches most likely). If you want larger swaddlers, try purchasing a flat sheet then cutting it to your preferred dimensions. When I make a swaddler, I first pre-wash the fabric. Next I cut it to size then round out the corners with my scissors. Finally, I use my serger to finish the edges. I'd venture to say that picking the fabric is the toughest part of the whole project. 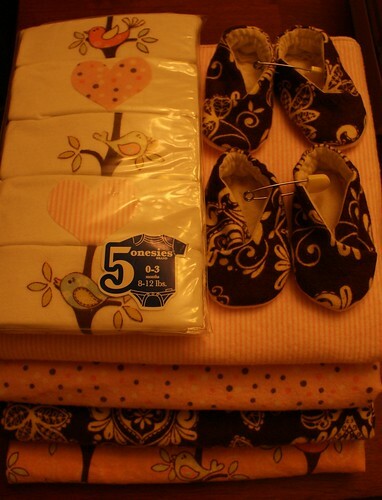 It contained 4 large swaddling blankets, 2 pairs of shoes (she's having twins) and 5 onesies with appliques created from left over fabric after I made the swaddlers. I love taking the time to create handmade gifts for people whenever I can and I think this set came together nicely.